Set in the colourful town of Dikwella, with its tuk tuks and traditional markets, The Lookout welcomes vacationers with its breezy, tropical vibes. Enjoy living spaces that are bright and airy, bedrooms with views out to the ocean and interiors that are kept cool with sea breezes all day. A wide beach frontage, just steps from your villa is where holidaymakers spend hours lounging lazily along the coast. With its incredible setting, peaceful environment and modern amenities, The Lookout is a great option for honeymoons and family holidays. 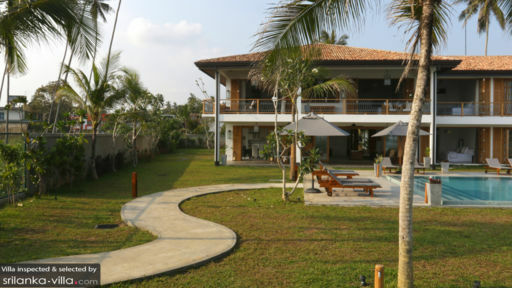 Rent the villa along with its neighbouring property, The Boat House to house a total of 22 guests. Wedding celebrations, parties and events are accommodated only when both villas are rented. The Lookout boasts an incredible outdoor compound. A sprawling garden peppered with swaying palms and lush tropical foliage spreads out towards the beach. The focal point here is the 17-metre swimming pool that looks out to the ocean. Framed by a pool deck kitted out with multiple sun loungers, this is a favourite hangout for sunbathing, cooling off with a refreshing dip and sundowners. Daily breakfasts are served at a wide veranda overlooking the pool. Pull back the glass sliding doors to reveal an indoor-outdoor living area featuring a neutral colour scheme, open layout and tasteful home ornaments. A wonderful selection of postcards, photos and maps of Ceylon - from the owners’ personal collection - adorns the common area. A lounge, kept cool and breezy with ceiling fans comes fitted with pillowy sofas and throw cushions. It extends out to include a dining area and guest kitchen complete with fridge, kettle, toaster and coffee machine. Your on-site chef will prepare meals in the main kitchen (situated elsewhere within the compound). Ascend the stairs to access an upper floor TV area equipped with DVDs, board games and books. With a butler and private chef, service at The Lookout is nothing short of impeccable. The staff will readily assist with all your vacation needs - from grocery shopping to car hire or making arrangements for tours and day trips. External manicures, pedicures, massages and facials service are available at extra cost. The home comes equipped with a collection of books, game console and five TV sets for entertainment. Dikwella is known for its surfing and beach life; its long, sandy coast is protected by reeds, sandbars and headlands, making the waters safer for swimming. 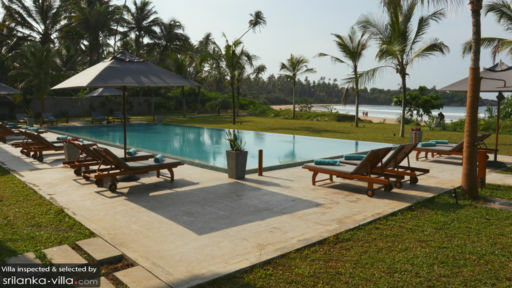 Hiriketiya Bay, a popular surf spot is five minutes’ ride by tuk tuk from your villa. 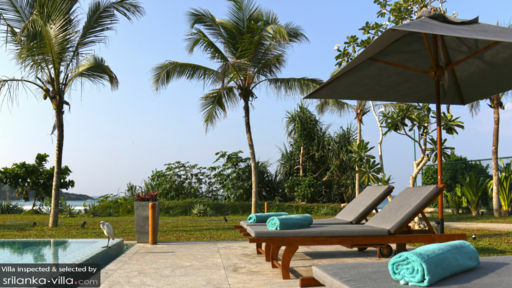 A 15-minute drive will lead you to Peacock Ayurveda Garden, a sanctuary for vacationers seeking out yoga classes, meditation sessions or Ayurvedic treatments. The famous Wevurukannala Buddha Statue is located a 10-minute drive away. Dondra Point, situated a 30-minute ride from your villa is ideal as a whale watching destination during the months of December till April. Another renowned whale watching site is Mirissa, located 45 minutes’ drive away. Nature and animal lovers will also enjoy day trips to Turtle Watch Rekawa (45 minutes’ drive) and the famed Yala National Park (two and a half hours’ drive away). Prior to my daughter’s wedding in 2018, we wanted to find suitable accommodation for all the family, travelling from all parts of the globe. The Lookout offered a short-term rent to us so that we could experience the property at first hand, rather than reading other people’s reviews! The villa is excellent in all respects but please bear in mind that it is ‘conjoined’ with its four-bedroom sister property called The Boat House. Both properties have their own dedicated compliment of staff who live in their own bungalow across the garden. All the rooms are very large, so that a full party of 12 won’t feel on top of each other. The property has its own short path leading direct to the amazing beach and the pounding ocean waves - fantastic for strolls through the water and watching the local fishermen in their outrigger boats. Overall The Lookout is thoroughly recommended. We recently had the most fabulous holiday at The Lookout and I can't recommend this place enough. It was the ultimate place to relax. The house is amazing, it is beautifully designed with stunning views of the sea. Ash and the staff were excellent and made us feel very welcome. They were always on hand to answer questions and to help arrange trips around the area. Premil is an exceptional cook and we had the most delicious meals using fresh and local ingredients. I have no hesitation in recommending The Lookout, with its amazing surroundings, luxurious bedrooms, beautiful bathrooms and a team of staff who went out of their way to make our holiday the most enjoyable and memorable experience. Thank you to Ash and all the other staff for looking after us so well and we will definitely be coming back.